We have noticed some products get listed to the wrong product on Walmart.com. This can result in orders getting fulfilled by the wrong product, cancelled orders, and missed sales. All things we want to avoid. The most common reasons for this are that your product is a multi-pack or there is a UPC / GTIN / EAN mismatch. Walmart uses a product's UPC or EAN to match it with the proper listing on Walmart.com. As they collect data from vendors, they grow their database of UPC's and listings. In a rare few situations, vendors have sent bad data to Walmart. Either they used a false UPC or mis-typed it. Walmart does not support multipacks that use the same UPC as the underlying single unit. Please de-list your multipacks (aka Kits) from Walmart in Zentail if they use the same UPC as the underlying single unit. 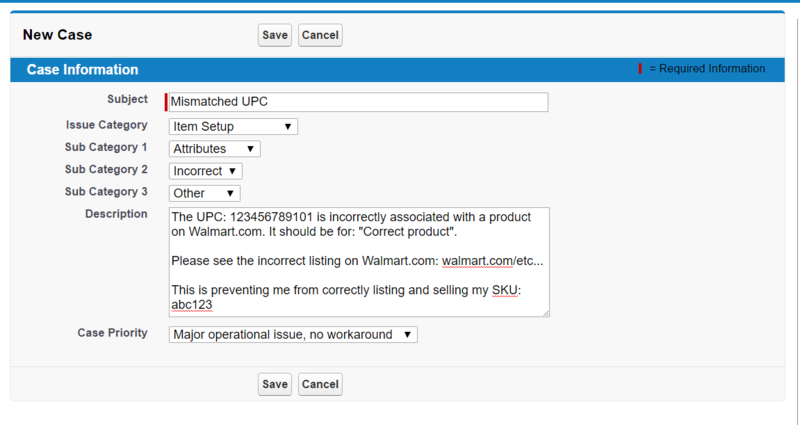 For example: If two SKUs have the same UPC and one SKU is a single unit, and the other SKU is a pack of 5, Walmart will only route one of your SKUs to their only listing for that UPC -- typically the single unit. Therefore, if you are listing Kit SKUs to Walmart that use the same UPC as a single unit, it is likely you will encounter a mismatch. Walmart is aware of this issue and they are working on a fix. We will update you as soon as more info is available. In the meantime, please de-list your multipacks (aka Kits) from Walmart in Zentail if they use the same UPC as the underlying single unit. Walmart uses a product's UPC or EAN to match it with the proper listing on Walmart.com. As they collect data from vendors, they grow their database of UPC's and listings. In a rare few situations, vendors have sent bad data to Walmart. Either they used a false UPC or mis-typed it. First, please verify that your UPC is valid and correct. If it is correct, this means another seller listed the wrong UPC to the "incorrect" listing. Toggle that SKU to don't list in Zentail. Open a case with Walmart support.